National Youth Leadership Training is an exciting, action-packed program designed to provide youth with leadership skills and experience they can use in their home Troops, Crews, Posts, and Ships and in other situations demanding leadership of self and others. National Youth Leadership Training (NYLT) is a 6-day course that provides youth with leadership skills and experience they can use throughout their lives. Some will apply these skills in their home Troops, Crews, Posts, Ships, school, athletics, church mission, military service, marriage & family, career, or all of the above. 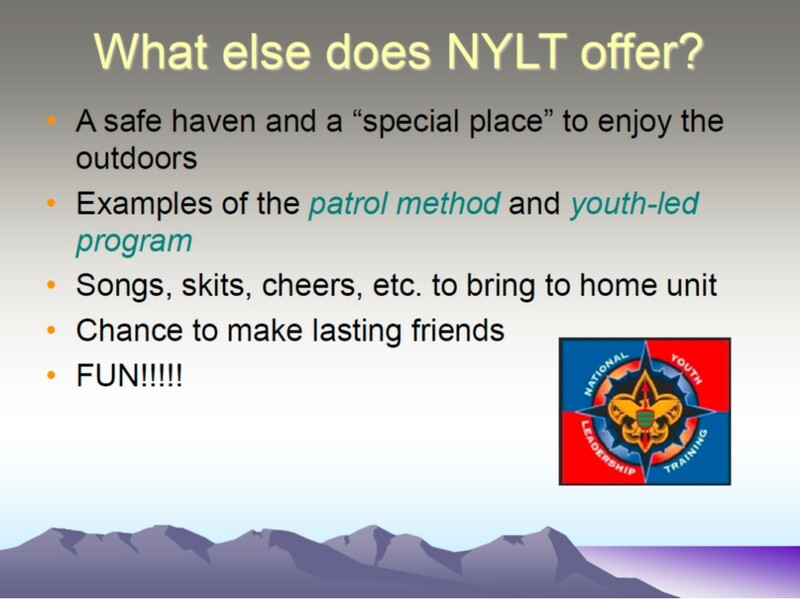 NYLT strengthens Scout units, individuals, families, organizations, and the country. The course is led and conducted by youth, who were participants in previous NYLT courses. The NYLT youth staff are trained and supervised by well-trained adults, many of whom have completed Wood Badge training. The NYLT course centers around the concepts of what a leader must BE, what he/she must KNOW, and what he/she must DO. Through fun applications, the skills come alive during the week as the content is delivered in a team and outdoor setting. Interconnecting concepts are introduced early, built upon, and aided by the use of memory aids to employ the leadership skills throughout their lives. NYLT is fun with a purpose! NYLT course content is very similar to Wood Badge training for adults, except even more fun! Participants will learn how to create a vision, set S.M.A.R.T goals, solve problems as a team, and learn the four stages of team development. They will practice effective communication skills, resolve conflicts using E.A.R, and learn how to assess and improve their team using Start, Stop, Continue methods. They will practice the learning and teaching E.D.G.E. They will also discuss making ethical decisions and how to value people and diversity with inter-faith services and an environment of mutual respect and the Scout Oath and Law. Participants must be a registered Scout, at least 13 years old, First Class in rank in a Troop, or be a registered member of a Crew, Post, or Ship with a working knowledge of camping, cooking, and outdoor skills and have completed Introduction to Leadership Skills for Troop/Crew/Ships. For 2019 only, an exception will be granted for girls registered in Scouts BSA to attend NYLT without first achieving the First Class rank; they must still meet the age requirement and first attend Introduction to Leadership Skills for Troops (ILST.) This will allow new troops to have trained youth leaders. Youth who are registered Venturers, Sea Scouts, or Explorers do not need to achieve the First Class rank, but must attend Introduction to Leadership Skills for Crews/Ships (ILSC/ILSS) prior to participating in NYLT. Participants should be a “credit” to their unit – dedicated, self-reliant, and responsible. To maximize application, they should be serving in, or about to serve in, a Troop/Crew/Post/Ship leadership role. This course will help strengthen the relationship between the participants, their unit leaders, and their fellow Scouts. How Will it Be Safe? The course will be conducted in compliance with BSA’s Youth Protection and safety policies as outlined in the Guide to Safe Scouting. Participants will be grouped together into patrols, and individuals move about camp with at least one buddy, but will sleep alone in their own tents. Possessing electronic devices, such as phones, will not be permitted outside of tents. (Please note, signal quality is very spotty at the National Guard.) Emergency contact with participants can be made by sending an email to David Van Wagenen at any time. How Much, and How Do I Register? If paid in full by June 1st, the registration fee is $200 which includes all meals, insurance, instructional materials, recognition materials, and facility costs. After June 1st, the fee increases to $225. Each participant must provide his/her own individual camping equipment, including a mess kit. A deposit of $100 must accompany the registration form, with the remaining amount due prior to July 8th. The course is limited to 56 participants, so early registration is highly recommended. Final registrations are due no later than July 8th. (Deposits are non-refundable, but transferrable.) Every participant must submit a completed BSA Annual Health and Medical Record #680-001 (parts A, B, and C) no later than July 8, 2019 (can download at http://www.scouting.org). 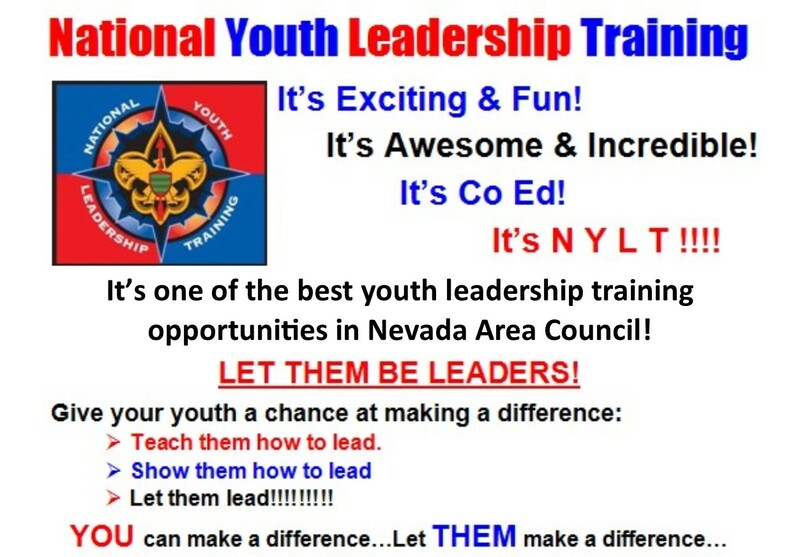 Contact NYLT Course Director, David Van Wagenen (775-267-7247 or dvanwagenen@charter.net). Before 6/1/2019 a discount of $25.00 will apply to all Participant Registrants.